I was lucky enough to escape the long British winter and visit Southern India earlier this year. The minute I walked out of Cochin airport I was transfixed. The colour, the people, the warmth – I just knew I would have a wonderful few weeks touring the state of Kerala (“God’s country”). It was a colour that overwhelmed my senses the most. The th2designs studio is based in the heart of Chelsea Harbour where I am lucky enough to work in a space crammed full of amazing fabrics and finishes and just walking out of the door of our studio into the Harbour I am surrounded by some of the best fabric houses in the world. But to spend time in a country where gorgeous fabrics are everywhere was even more of a feast for the eyes and Indian silks are available in a staggering array of colours, textures and patterns. The elegance with which these silks are worn by the sari-clad women was just inspirational – beautifully demonstrated by the wonderful Mary who looked after us when we stayed on a lake in the famous backwaters outside Cochin. The idyllic temperatures we enjoyed during our trip (the perfect English summer’s day combined with a daily tropical downpour) ensures that the Keralan flowers and vegetation are second to none. Scarlet reds, tangerine orange, saffron yellow and hot pinks all clash and combine in perfect harmony and are found everywhere, from a roadside offering bowl of flowers to a shady outdoor sitting room. Back in London, I shared my photos with the team who were inspired to incorporate some of this vibrant colour into the much cooler, more neutral palettes that are so popular with our clients. 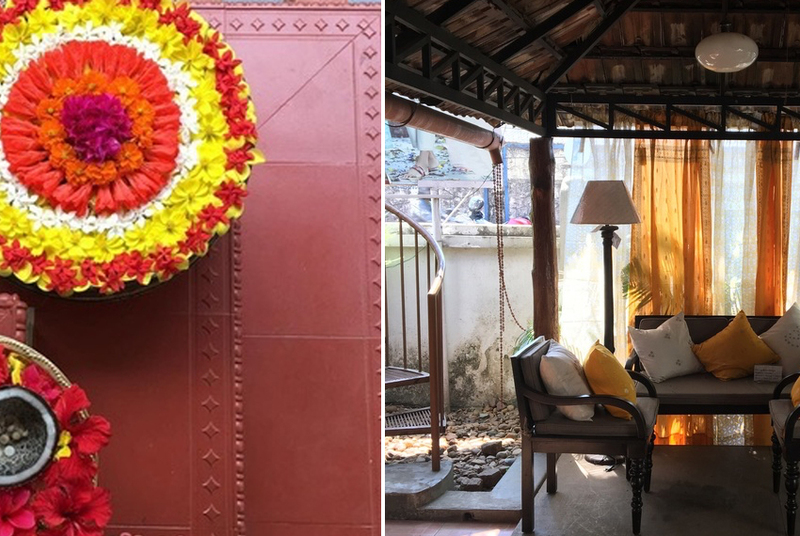 These schemes suit our climate and the different light we have in the UK, but a splash of the sari silk orange or saffron yellow combined with patterns in the same tones sit happily alongside these more neutral schemes and inject a shot of the vibrancy and joy that is so abundant in Kerala. A little slice of India available right here!